Lexi’s friend Erin‘s two-year-old son is obsessed with Charlie Rose (! ), so naturally she ordered him a Charlie Rose cake (from Cake Clique). 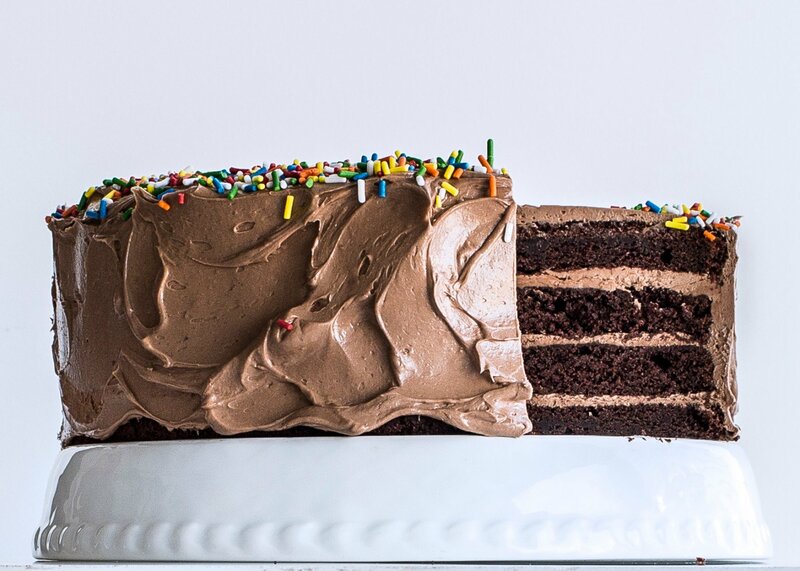 Four-layer chocolate cake with Nutella buttercream. Rice Krispie treats with layers of peanut butter and chocolate frosting. Vanilla cake with strawberry filling. Thoughts? Which cakes do you like best? We might also do what my friend Abby does — decorate a simple cake with small toys and call it a day! P.S. 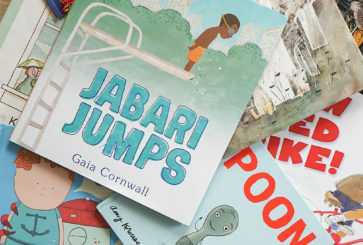 Slamdunk birthday gifts for kids of all ages. just been and bought a store one for my son’s birthday tomorrow. I plan on removing the decorations and covering it in chocolate ganache and an upside down ice cream cone as he’s ice cream mad! It seems like a fun annual tradition to make his cake a “surprise” rather than the same recipe year after year. I really like anton’s cake the best, never heard of a more fun cake :) and glad to see he still loves it! What about cupcakes and then have a little topping section set up so the kiddos can decorate their own. We always used unsweetened whipping cream and Mom made it loaf shaped and “frosted” the whole thing with whipping cream. You make it the night before so the wafers get soft and taste like the outside of an ice-cream sandwich. SO, SO good. And simple! Oh yeah! I have made a version of this cake before, for my husband’s birthday, which is in the summer (great as it requires no baking). I had a little bit of a hard time finding the chocolate wafers, but I did eventually find them! so far we have always got a place vanilla butter cream sheet cake from Wegmans which we decorate ourselves to fit the theme of the party.. I love the little dinosaurs on the first cake!! You should probably go with whatever flavor Anton likes the best. I think a simple cake with little toys on top makes a great birthday treat–you get cake and toys! I love the rice krispie cake idea. You know a cake cookbook is iconic when there are several FB pages dedicated to its contents. The AWW cookbook is the equivalent to a Christmas Advent calendar, studying its pages, having in-depth discussions with siblings and then finally watching your selection get made all helped to build the excitement about our birthdays each year. It was one of the first items I purchased when I found out I was pregnant with my daughter and my mum still has the original on her shelf at home. 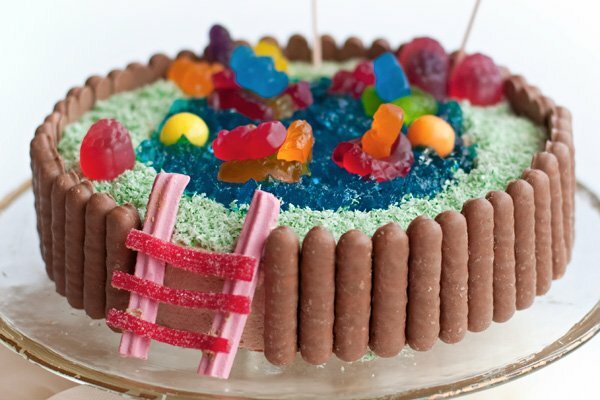 The rice krispie treat cake is such a cute and unique idea! My mom always made cakes in the shapes of easter/spring things (most memorably a bunny) since my birthday always fell around Easter. As little French kids, my mum’s birthday cake of choice for the three of us (we didn’t want anything else) was a chocolate hedgehog; she would bake a fluffy light chocolate sponge cake, cut it in half and assemble the hedgehog by spreading nutella ganache in between and all around, smarties for eyes and slivered almonds for spines. Délicieux! so cool!! my friend is from australia and she said that her mom gave her a copy of the book when her first son was born, that is what an institution it is! how fun for kids. We have it in England too (or we did in the 80s) and we treated it like the birthday bible. My Mum made almost every cake in the book (there were 3 children). The swimming pool was definitely the hardest and weirdest – using jelly (jello) in the middle of the cake for the water! I’ve never been a traditional cake person. I always requested pie or cheesecake. One year, we did S’mores and I loved it. 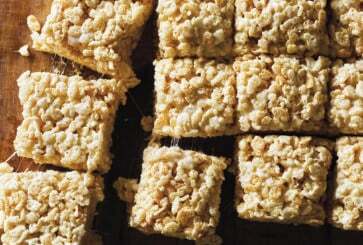 I love the idea of the Rice Krispie Treat cake! Definitely something from the AWW cake book! I grew up with their cakes & I love that my children are now choosing the same cakes my siblings & I had all those years ago. Our cake book actually lives in my husband’s car & my girls entertain themselves for ages flipping through & choosing what cake they’ll have. Even if it does change on a daily basis!! When I was a kid, my mum often make cakes that looked like the ones in the women weekly’s cookbook. I remember I was always in love with them, seeing them made from start to finish. so my vote goes for those kinda cakes, if not the rainbow cake just because kids love colourful things! Ooooh, I love all of these! I swear by the Hershey’s cocoa powder box cake recipe. So easy and works every time. I don’t do any crazy decorating, but sometimes I use raspberries or throw some sprinkles on it. Noone has ever complained. My son always loved a volcano cake. It was brownies stacked into a pyramid with whipped cream coming out of it and sparkler candles. It was a hit every year. My sister does: brownie mix on the bottom and baked. Then any flavor ice cream (very soft) spread across that. Then cool whip spread across that. If you freeze it, you can decorate it anyway you want. So easy and delicious and easily customizable. Growing up we got this rum cake…layers of cake and rum-flavored filling with the frosting on the outside covered in chopped walnuts. Its memorable. but not my favorite. I love angel food cake (with powdered sugar but you could also do fruit), or pineapple upside down cake. 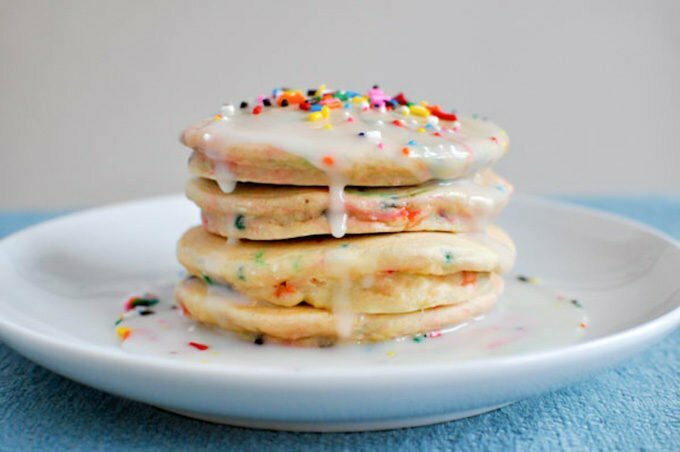 The pancake idea is sweet!! Since my son has been born I’ve done theme cakes for him. I can’t wait when he can start asking and contributing to the ideas! This year I can doing a shape of number 3 with race tracks on top for his car party. The Dinosaur one is my favorite! I used to be OBSESSED with chocolate wafer icebox cake, and had it every year for my birthday growing up. It’s delicious, so easy to make (which is great for kids), and the best part is that when you cut it diagonally, your slice is striped black and white! For this reason it earned the name “zebra cake,” making it even more of a hit with kids. The best. I like the non-cake cakes of now- cakepops or cupcakes! So delicious, pretty and easier to serve! or the donut cake you had for Toby’s birthday! If you like chocolate, I highly recommend Ina Garten’s chocolate cake. This is my go-to cake recipe and everyone LOVES it. My girls are grown, so lots of cakes over the years….many times banana chocolate cake with chocolate cream cheese frosting, decorated with pansies, violas and mint from our garden. So easy to make it look pretty and for the adventurous kids, all edible. I adore the fruit cake idea. Great suggestion and display. My 8yo son prefers a big box of donuts over cake. The kiddos love it! EVERY Aussie kid wanted the pool cake! It was such a big deal if someone had it. My daughter’s birthday is in May and she requested an icecream cake for her birthday and it was a huge hit! We had a pool party for her and it was the perfect treat for after. I always have cake leftover but barely had any left this time. I think this will be our tradition for her birthdays since she’s not a fan of cake anyway. 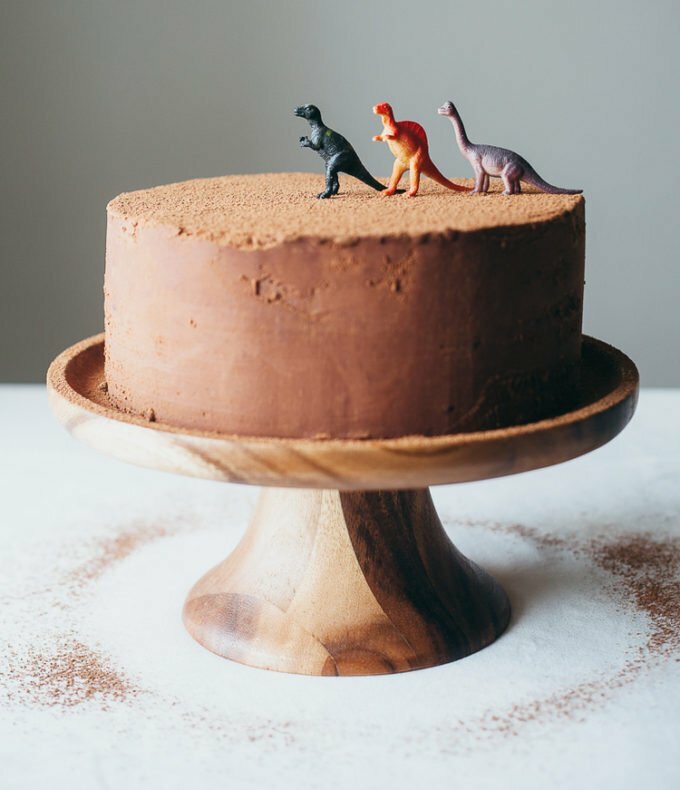 Do you have a link to the recipe of the cake with the Dinosaurs on top? Ha, I’m 26 and I still request a teddy bear cake. My mum found a teddy bear mold when I was about 3, and it’s now the family birthday cake, with smarties for the eyes, nose, mouth, paws and buttons. Butchering teddy was sometimes too much for us though, so my mum would have to slice the head off and cut him up! Love this! I’ve had a 3 layer rainbow chip cake with rainbow chip frosting every year since my third birthday (nearly 28 years!) 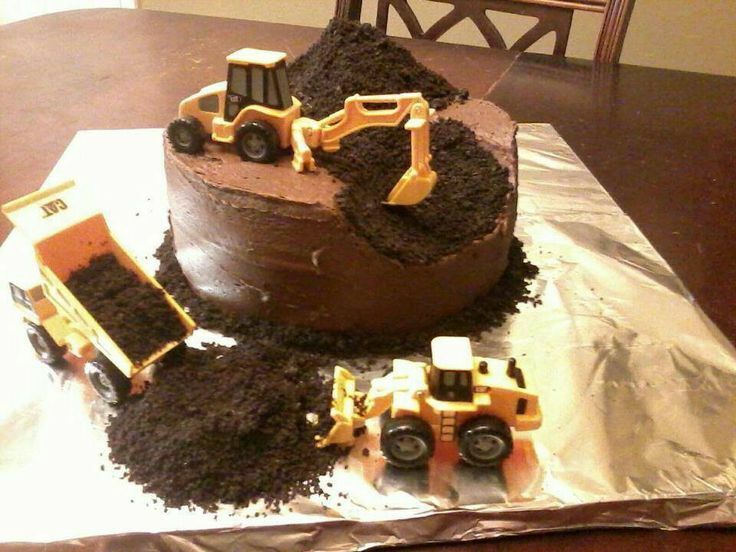 and my younger brother has always had a “dirt” cake. My mom would buy a garden planter, line with paper, and fill with a yummy blend of crushed oreos, chocolate pudding, vanilla pudding, and of course gummy worms. Tractors line the top every year – even today! I LOVED dirt cake as a kid! It was the best!!! Growing up here in Belgium, our mum always made a candy train cake. There are a lot of elaborate recipes and designs to be found, but she did an easy and delicious version. Bake 2 rectangle shaped vanilla cakes (or use store bought vanilla cake, always worked). Cut up the cakes into a locomotives and cars and assemble on a plate. And then the decorating could start (something which she always let us help her with). She usually made butter frosting to stick the candy to the train. We used gummy bears as passengers, sour flying saucers for wheels, and basically any type of candy we liked to stick to the cars and locomotives. Best memories! I am 18 from Cornwall, UK and I love your blog! these cakes are so amazing, I was pleased with the way the one I made for my brother’s birthday came out but then I saw these!! I am a chocoholic through and through and that nutella one is right up my street! My mom is an excellent baker, and thankfully I inherited her skills! She has a recipe passed down from her grandmother that she made for every birthday. To this day, our family refers to it as “birthday cake.” It’s a simple, 3-layer vanilla cake with “marshmallow” frosting (basically whipped egg whites and sugar). 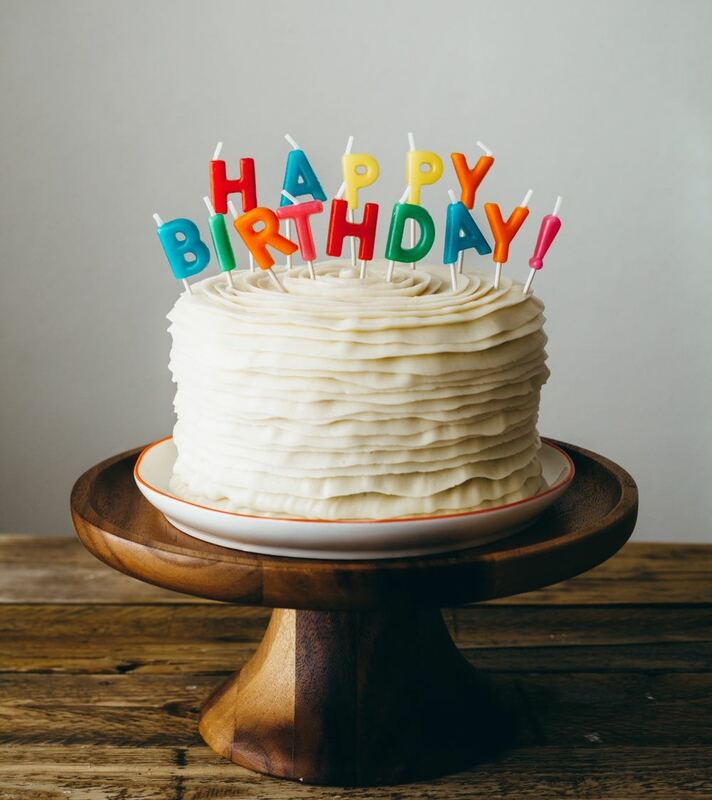 The cake was always frosted white, and then we’d add a color of our choice to write Happy Birthday _____ on top. It is still one of my absolute favorite cakes, and reminds me of my childhood. I recently adapted it into cupcakes for a friend’s baby shower, and they were a huge hit! And also there is this cake, the Smith Island cake. I had a slice once when visiting Tylerton on Smith Island and it is amazing. Although I think I would go insane trying to make one. Southern Living had a vanilla cake on their December cover a few years ago and it is seriously delicious! We interchange the fillings but this has become our defacto standard cake! My birthday is end of May and the whole time growing up, my special cake was a strawberry cake with whipped cream frosting. Still my favorite. I think it is a white cake with strawberries in the middle of the two layers and on top and the whole thing is iced with a substantial whipped cream….sides and top. I was never a big fan of grainy sugary icing. Needs refrigerated and not great to take somewhere, but sooooo good with local berries. My father’s family is from New Orleans, so we order a king cake every year for my son’s February birthday. It is my favorite tradition (aside from Gumbo on NYE) and the kids love searching for the baby hidden inside. Maybe this was an 80s thing, but growing up my choice (as well as my brother’s) was always one of those form cake pans (dinosaur, ballerina, etc) and then covered in frosting and dyed coconut. I remember as I got older my mom telling me how terrible those form pans were to get cake out of, but we loved them! another fun pennsylvania tradition: whoopie pies. like donuts, these could be easy to stack & serve, and come in amazing flavor combinations! I have two to three cakes that I make really well so they have become the standard Birthday cakes for our family. We have a banana cake with cream cheese icing that came down the family line from our grandmother and that is always done for one of my children, Nigella Lawson did an amazing stack of brownies once which she added thin long metallic candles too and that one is a semi regular for my husband, I have a flourless chocolate cake that I cover in chocolate ganache and raspberries and that is my Easter cake for family lunch and lastly on Christmas Day which is my husband’s Birthday I make a traditional Australian pavlova and add candles to it. When I was young my mother made me several iconic cakes from the Women’s Weekly cakebook – it is definitely an Australian classic. We do Smitten Kitchen’s Yellow Birthday Cake. It’s soooooo delicious, but we use vanilla buttercream frosting because that’s what my girls like. 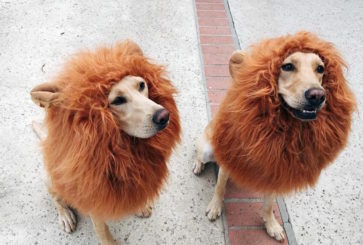 Every year they choose the theme. Last year it was pink and purple fairies. This year, it will be a “girl’s Star Wars cake” with Rey, Leia and Captain Phasma toys. Sometimes, I put lemon curd or chocolate ganache between the layers. Everyone in our family raves about this cake. All 107 of the women’s weekly cakes have just been displayed here for a charity event – the first time they’d ever all been made up in the one place. I’ve also heard this tip: buy a square tub of ice cream, tip it out on a plate, decorate with lollies = totally fabulous ice cream cake. We always do carrot cake with cream cheese frosting as the “base” to our cakes. It seems like adults and children can all get down with a slice of carrot cake! ;) We just decorate it differently according to who is having a bday. In Saturday my oldest turned 6 so we colored half the icing blue and have the icing brown. Then I added graham crumbs in too if the brown icing to make sand and made little peaks in the blue side to make water. We put some shells on top of the sand and an inverted mermaid tail from a Barbie in the blue part. 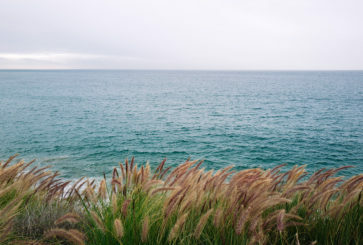 It looked like a mermaid half submerged in the water alongside a beach! I love the pancake idea! Do they read those books in the US? It’s a staple for German kids (much like anything from Astrid Lindgren). I love that you included the swimming pool cake (my all time favourite) from the Australian Womens Weekly recipe book – its iconic in NZ and Australia and most kids grew up having birthday cakes from that book. Im now in my mid 30s and my friends and I are now making cakes from the recipe book for our children. The Australian Womens Weekly Cake Book is (seriously) a daily-read in our household. My soon-to-be-5 year old son just can’t decide (fire engine or cricket field). It is a total institution and I think most homes have one or more of them. 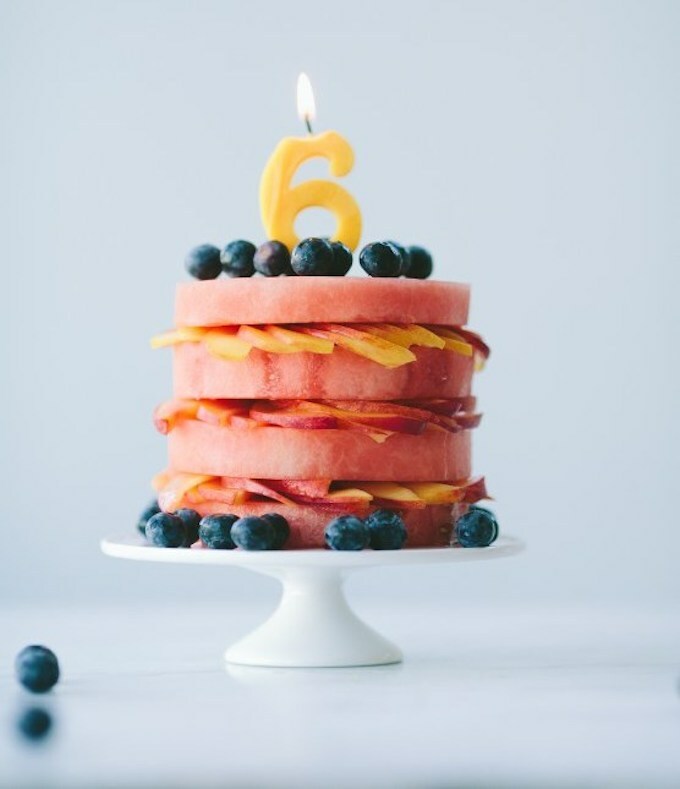 My youngest son has a summer birthday and I bought the biggest watermelon I could find and hacked it into a cake shape. it was awesome and I didn’t need to turn on the oven! For 4 and under we did cupcakes with whipped cream and berries. For 5+, decorate your own cupcake is the new tradition. Both are low on effort and enjoyed by the kids. I am not into theme-y cakes and growing up I got to choose the flavour of cake and icing but it was almost always a “normal” cake. One year my mum did a “hamburger” cake though with marzipan lettuce and cheese peeping out between chocolate and vanilla layer cakes. And when I was 8, she made a “number”cake . My husband remembers a year his mom baked his cakes in ice cream cones. I think those ones stand out more since we didn’t get a crazy cake every year. 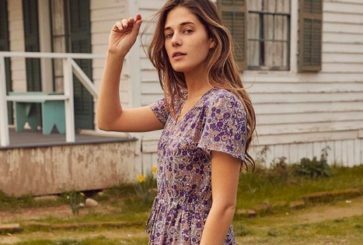 I love your low key approach especially as you are a high profile blogger who could easily feel the pressure to turn your kids parties into over-produced events. The simple and fun we see will surely be making the best memories for them. I hope you will share what you and Anton decide on! Since Anto is born in July, I think that the fruit cake is the best. But I am also team pancakes! Let him decide, he won’t be wrong. Love the toys! One of our favorite back-to-school parties was a bug hunt with a Central Park ranger, pizza delivered to the park and cupcakes with toy bugs and butterflies on top. I’m crazy about the first one with the dinosaurs because I like cakes that look a lot simpler on the outside. But for a little kid, I would say anything sweet with pops of color! The Nutella one looks great! Chocolate dump cake in a bundt pan. It’s been my son’s request since he could talk. He’s now 30 and still wants it. My daughter loves cheesecake. She chooses a different one each year. Maybe the filling might be a tad grown up for Anton, but I love the look of Local Milk’s waffle cake on her blog! Love that you included the Aussie cookbook. At the start of our birthday month my siblings and I were allowed to get down the book and choose our cake for that year. It was serious business. So much thought went into choosing! And then my poor Mum had to make them all. When I fell pregnant I gave a copy of the book to my Sister In Law and told her she was responsible for all future birthday cakes for my daughter. I don’t have a baking gene in my body but happy to know that the tradition lives on! I love the Australian Women’s Weekly cakes, have made quite a few and let the kids choose. They love spending time choosing which cake the want from the book! So thrilled you featured the Australian Women’s Weekly birthday cake book. Every Aussie kid I grew up with pored over that book for a whole 364 days before their next birthday. And even opening it now brings back fond memories for me – I can still tell you which cakes I had made for me growing up. I continue the tradition for my husband and sons (who, unluckily for me, have birthdays within 5 days of each other). Last year, for their combined birthday party, I made the lion, the giraffe and the duck. A triumph, although I was up until 1am perfecting them! Really helps to stick to one colour of icing! 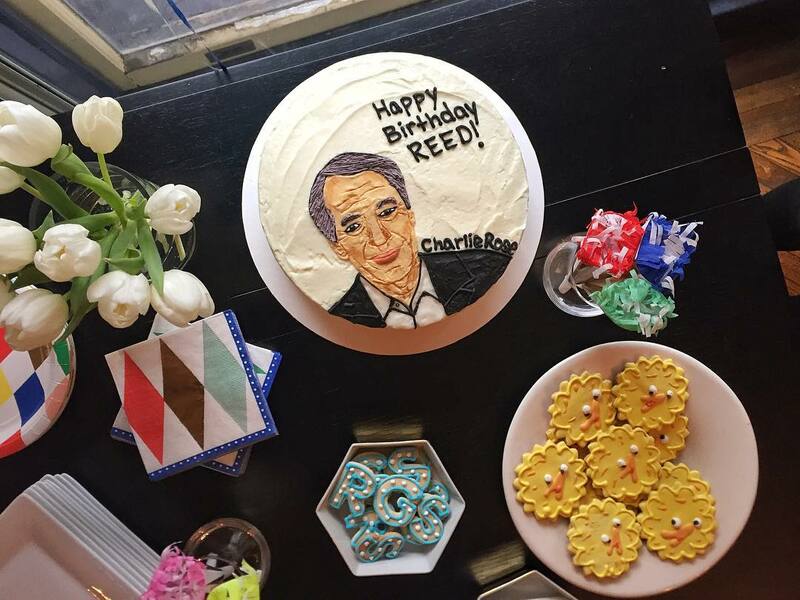 The Charlie Rose cake is my favorite! haha! I love Cheryl Strayed maybe I can have her on my cake. A Dear Sugar cake would be soooo good. The fruit cake is genius (I would add a little whipped topping). I love the donut cake! I love donuts. I let my boys pick whatever cake they want for their birthdays. They have so much fun contemplating all the different options (because, omg! endless! ), and they’re always excited. When they turned 2 and 4 (birthdays are 3 days apart, so joined birthday parties for life! ), they chose chocolate and strawberry. At 3 and 5 they chose chocolate (I guess it was a winner) and blueberry lemon. And yes, even my husband gets to make a birthday cake request. I love baking. Our oldest has an early January birthday, and we like a low-key party with mainly family anyway, so we’re settling into a habit of birthday brunch. Carrot cake! That way we feel less guilty giving it to our son, because vegetables, am I right? I like the homemade Australian women’s cook book ones- they are so whimsical and fun and can be changed to the kids’ likes that year. My mom would always make a cake and then give every kid at the party a pastry bag full of frosting and we decorated the cakes ourselves. LOVE that you put in the Womens Weekly cake. My three kids pore over that book just like I did. I give it out for them to look at just for fun sometimes. It gives me 5 minutes. The treasure chest is good, as is the lamington train and I am no baker (or cake decorator). The Rice Krispie treats cake or the pancakes would be a hit at our house and my kids are grown! He’s so funny! So true, Anton, you never know how things will end up! I like the rice crispy cake. It’s fun and different like Toby’s doughnut cake but I also really like the vanilla with strawberry filling idea. Such a classic birthday cake. Oh my goodness, that Charlie Rose cake. I have never wanted to be friends with a child more. Aww, thank you! I personally think he’s pretty amazing, but that comes with a pretty high bias level. When I was a girl my mum had the woman’s weekly birthday cake book and we picked our cake from there. Now that I am a mama, we do something similar. We sit down and go through the same book (and a couple others I’ve found in recent years) and the boys pick something. They all look delicious but I have recently become obsessed with Nothing Bundt Cakes, which I would recommend for a birthday party. My family had some for Mother’s Day and it was a hit! Also, when I was a kid I always loved the giant cookie cakes with icing decorations on them. Also my MIL has a funny story…her mother only made angel food cakes for everyone growing up. When she dated my FIL, she made him one…not knowing only chocolate will do for him. “It’s just what you did for birthdays” she explained. I always get a birthday pie instead of a cake! Strawberry rhubarb or blueberry were my favourites growing up. My family also has a hilarious accidental ‘tradition’ for my Mum on her birthday. She was always very clear about not wanting her age written on her cake. My Dad would always forget. Her age has been appearing on her birthday cake for years now. If he’s placing the cake order we still have to send reminders to NOT do this (although now it wouldn’t quite feel like her birthday celebration if there wasn’t some friendly cake drama :). My daughter turned two in April and I made the strawberry mascarpone tart you shared on your site in March, except I shaped the tart into a heart. It turned out beautiful and was so sweet for a younger child (also tasty and sugar free!). I’m a spring baby too and growing up my mom always made simple cakes with lots of fresh flowers, fruit and good frosting. I think that’s where I got the idea that birthday cakes should be beautiful (and most importantly, they should taste good!). I love the idea of having a traditional cake that is eaten every birthday. My husband’s mother always made her sons Red Earth Cake for their birthdays. It’s a family recipe her mom gave her and I wasn’t allowed to have the recipe until we were officially married. I still haven’t mastered it yet, but I am hoping I will one day. It’s a delicious chocolate cake with brewed coffee in the icing and cake. So delicious! We order our cakes from Buzz Bakery in Arlington, VA. So yummy!! I use to make a simple box cake and who’s ever birthday it was got to help me frost it and put sprinkles on it. However as the girls got older they wanted more complicated cakes and it was just cheaper to buy a cake than make it. Also- that pancake cake reminds me of the best scene from Unclf Buck! Anyone else? I made my son an airplane cake last year for his second birthday that tasted great and looked like the plane wreck from Lost. Other notable cakes in my family: my brother was obsessed with some book that had a pickle cake in it, so for his 4th birthday, my mom made a pistachio cake with green icing and decorated the top with sweet baby pickles. It was just as gross as it sounds! ? Before my son’s 1st birthday I bought two packs of tall hand dipped multicolored birthday candles (16 total). I plan to use the same candles from the birthday/s before, adding a new one each year so on his 16th birthday he will have 16 candles on his cake that will be the same candles that he blew out from the 15 previous birthdays. His 2nd birthday is coming up in July and I’m so excited to use the same candle we used for his 1st birthday and a new candle for his 2nd birthday. I can’t wait to see the gradual difference between the candles year after year. His cake will also be served on the same plate every year, a plate I made just for him. That’s such a sweet tradition. Those candles sound beautiful! I like a good, classic chocolate cake! 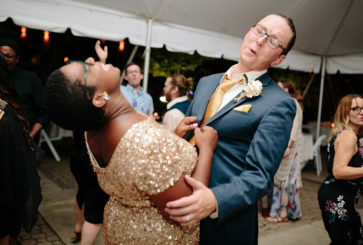 I love that you had one for your wedding reception – such a great idea! That is so funny about your daughter! I love the rice crispie cake! Falls along the same super-easy but slightly off-beat category as the donut cake. In my husband’s family all three kids have their own cake too (just typical cake but with different flavor and frosting combos). Even now in their 30s my MIL still makes “their cake” every year. It’s such a fun tradition! My girls both love the Pink Lady cake from Smitten Kitchen. It’s so tasty! So many good ideas! I love the watermelon cake. We used to use watermelons for my mom’s birthday cakes when I was younger (not sure why we stopped the tradition). My dad would just poke holes in the top to put candles in. 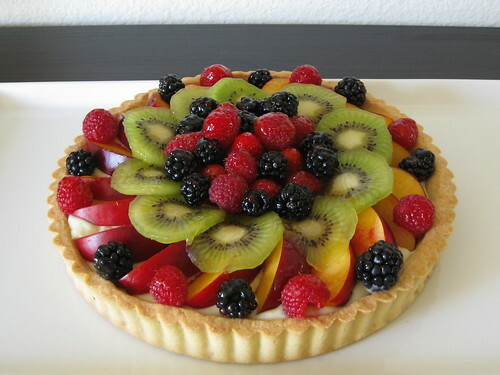 I love the idea of the layers of fruit though. I’ll have to remember that for her birthday in August! I make my boys the same double layer, round cake every year, but change the top to suit their interests. My younger son’s cake this year looked just like the dino one pictured above, but we made little party hats for the dinosaurs. Other toppers have included: hot wheels, legos (mini figures can hold thin candles), farm animals, mini superhero figures….often whatever their favorite toy is at the moment and the number of mini toys on top = the age they are turning. As an Aussie I grew up with that iconic cook book – each year we got to pick which cake we wanted from that book- we had everything from Frankenstein (Halloween baby) to a 4 tiered layered castle! I vote the women’s weekly – it is one of my favourite birthday memeories! Joanna, how did you get Toby to stick with loving and anticipating the donuts cake each year and not ask for something super elaborate that he may have seen at other birthday parties? I ask because our baby’s 1st birthday is coming up and mother-in-law has been asking what I will bake. She is famous for the super elaborate birthday cakes she made her kids growing up, and has told me many stories about how she’d stay up until 2 or 3 AM to get the cakes done in time. So much love, so much dedication, but… good for her! not for me! haha this is me!! So pleased I’m not the only one avoiding this! “Good for her! Not for me!” The best all time motherhood quote, Wish it was tattooed on Mummas at their births! The pancake cake looks so yummy! I have a tradition of making elaborate cakes for my husband’s birthday each year (all decorated based on Internet memes) so I feel like I need to do a really great job with the cake for my son’s first birthday… But mostly I just want it to be yummy and satisfying! I’m planning to do a traditional yellow cake with a chocolate buttercream frosting, since I usually do a rich chocolate cake for my husband’s birthday. When my son gets older I will go with whatever he wants. It’s also fun to think outside of traditional cakes – I bake birthday pies for my dad and one of our close friends, since that’s what they prefer. My only “rule” is that it has to be made with love. Same here! My mom makes me a funfetti cake every year (I’m 31!). Good times. I’ve made the cardamom-vanilla cake and holy whoa is it good! But for kids, that Rice Krispie cake is adorable! I love the first option because you could change the toys every year. 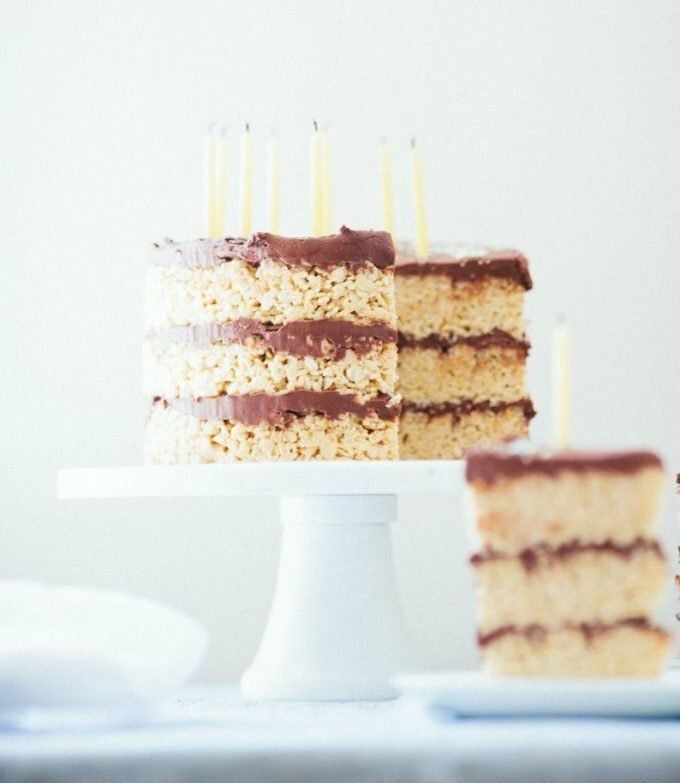 I also love the rice crispy treats layer cake – yums! When I was a kid, I did not like icing, so my mom baked a pound cake every year and decorated it with fun candles. Of course as an adult, I love icing, but pound cake still tastes like birthday times to me. My daughter’s most recent birthday cake was a regular layer cake colored red (she doesn’t like red velvet), black frosting and covered with sugar eyes. Previous cakes have been bright rainbow or ombre layers with vanilla frosting and sugar flowers, so they look pretty and sweet until you cut into them. I use gel food coloring for the intense shades. Btw, my daughter just turned 25. My mom used to make an ice cream cake – which was just a (bought) cookie crust with an ice cream filling and some chocolate syrup drizzled on top. Delicious! Jo, I just copied your donut cake for my son’s second birthday party on Saturday morning. He hasn’t stopped talking about it. ? I often request an ice cream cake. It’s a super fun take on the cake idea but I prefer ice cream to cake! I haven’t thought about a yearly traditional cake, but when my mom was making my cake (other than younger years when my grandma would decorate an elaborately piped cake, like Precious Moments or a cartoon), I always requested Cocoa Apple Cake. It’s a chocolate bundt cake with grated apples (you can’t taste them), chocolate chips, and a thick chocolate glaze. So chocolatey and good! I still have to have it. My husband thought it was so funny when I HAD to make it later in my birthday week since he had insisted I not make my own cake on my birthday. But I had to have it! Having a 2-year-old who is obsessed with Charlie Rose is essentially my dream and life goal. That is hilarious. and loved falling asleep to it. In fact, my Dad’s favorite photo of me from that age is me and my dad watching it together with me in his lap! For my nephew’s 7th birthday, I made a s’mores ice cream cake. We brought it outside to the picnic table, and then my dad (Grandpa!) toasted the marshmallow top with a big blowtorch! Cake+fire=little boys minds blown. We used sparkler candles for a few years with our fire obsessed son. I got the ones shaped like numbers and his mind was blown when we lit them! I love the flambe idea!!! We’ve done homemade ice cream cake for my son’s birthday every year, which he loves – growing up my mom used to do a version with layers of angel food cake and ice cream with whipping cream as the “icing,” but we’ve done a version more similar to a DQ cake with oreo crumb crust, fudge, ice cream of choice, whipping cream. I’m also a June birthday and as a kid I always requested angel food cake with whipped cream and strawberries. I loved how airy it was and how it dissolved when I ate it. It always seemed so refreshing! Those are seriously laid back cakes! I usually order my children’s birthday cakes as I can’t get it together to organize the party and bake the cake. But one year I decided: this is it. I am going to Bake The Cake and I made an elaborate pink train similar to the one in Miss Moss (perhaps it is a Cape Town thing! Or South Africans are sold on that Australian Women’s Weekly cake book!) and it was such a hot day ( and too big to fit into the fridge) that it nearly melted … Before the party had even begun. Last year when my son had a Star Wars LEGO party I ordered the most beautiful cupcakes with the Star Wars characters iced on them – your sons would love those! Oh and to be fair, I made my son a green snake cake 2 years ago when he had a snake party (yes with a snake and reptile show) and he got to decorate it. I think that is me, done and dusted. I bake for big people now! That last pancake one is tempting!!! YUM! My grandmother always made tiny layer cakes for our birthdays. She did this for her husband (my grandfather), her two daughters, two son-in-laws, and three grandchildren. I’m seeing now that the NY Times ran a story on these cakes back in 2009 (http://www.nytimes.com/2009/12/16/dining/16Bake.html?_r=2&ref=dining). We started making them with her, and eventually for her, when her dementia made it difficult for her to remember how . She passed away a year ago this April, and I’d forgotten about these cakes until I read your post. Thinking back on these cakes, and the number of years we had to celebrate our birthdays together, put a bright spot in my day. Thanks for sharing your story. What great memories you all must have! As a child my mom would make me a barbie cake nearly every year which i LOVED! The cake is the Barbie’s dress (she would cut up marshmallows to make designs and flowers) and she used Barbie’s with missing legs and stuck it in the center. It was such an easy and wonderful cake for a little girl! I plan on making the same for my two little girls if they’re into dolls and barbies as they get a little older! also – speaking of donuts, I just posted a recipe for baked lemon blueberry donuts on my blog. They’re delicious and incredibly easy! My best/craziest birthday cake was for one of my son’s fourth birthday. He was in the middle of a firefighter obsession and wanted a cake that looked like “a house on fire with snow on the roof!” I made a banana chocolate chip cake in a loaf pan and carved it to look sort of house-like (more like a monopoly hotel shape), and then iced it with cream cheese frosting. The best part was the fire, though. I made a rum flambé that was poured around the base of the house, and he got to blow it out and then rescue the people decorations from the roof! The bottom of the cake ended up soaked in rum, so we just served the kids the top layer and the grownups got to have the delicious rum layer. you are amazing!!! i bet he’ll remember that cake for the rest of his life! I have 3 sisters and when we were very little my mom made us Barbie cakes (the ones where it’s half a barbie on a toothpick stuck into a “dress” cake). When we had a more standard style cake where there were candles we were allowed to lick the frosting off the bottom of the candles after they were extinguished…..this tradition does not translate well to the Barbie cake…licking the frosting off a half Barbie doll body with a toothpick bottom….creepy. Oh man. My mom made us cakes from this beauty in the 60s. I still have great memories of being able to choose which one I wanted. The fish was a favorite. Strawberry shortcake! That’s what my boyfriend has requested every year. His birthday is at the end of May so it is hit or miss whether or not they will be in season but for a June birthday they will be! My mom always made me birthday cakes from the Australian Women’s Weekly book and I loved how special they were. And last weekend I actually made a version of that swimming pool cake for my friend’s pool party birthday! I personalized it with with little pictures of bathing suit-clad friends and celebrities cut out and stuck into the pool with tooth picks. So fun! The edible image cake toppers on Amazon are a favorite, taking a photo that’s made into an edible cake topper. On top of a peach cake if he likes peach, would be nice. For ideas, Pinterest is fantastic. A strawberry shortcake cake is neat with an ice cream center. In the 80s my mom always did a train with three different rectangular Sara Lee cakes as the cars. Oreo cookie wheels etc. It was so simple, and so awesome! Summer birthdays = Ice Cream Cake! Nice tradition, many variations! Having a “tradition” birthday cake is so lovely for kids! My mom used to make a chocolate mayonnaise cake (which is insanely good–I’ll put a link to an epicurious recipe). She always iced it with purple frosting and put some fresh flowers on top, since my birthday is in June and there were always a few in the yard. The repeated cake felt comforting when I was a kid, and the flowers made it feel magical. I still feel nostalgic when I think about that purple cake with pansies on top :) What a fun thing to choose for your kids! My mom also put fresh (edible) flowers on my bday cakes as a kid. One of my best memories. When we were kids, my brother’s favorite birthday “cake” was always rice crispy treats – nothing on top, just the standard recipe. He wasn’t a huge dessert fan, but my mom was more than happy to oblige this request. For my daughter’s recent 2nd birthday, we had a small party with our neighbors, and I found a local home baker to make a small funfetti cake, with matching cupcakes. I used the colors as the party theme. It was perfect! My five year old loves lemon cake–just a simple loaf cake–and is counting down the days till his birthday so he can have it (in October! Ha.). I once made a Dora cake, and the kids cried when it was cut. Another time, there was a pinata cake. You bake cakes in round bowls, carve out the middles, fill with M&Ms, then stick the two halves together. It was fabulous and took everyone’s breath away when it was cut open to reveal the candy inside. But after cutting three pieces, it pretty much collapsed and the rest of the kids were disappointed. Later there was a pair of angel wings. And for papa, we did a swimming pool cake with blue Jello smuggled from the U.S. There was recently a birthday but no cake, no candles. I miss those early days! hahaha awwww. my friend’s little boy got a cookie monster cupcake and he wanted to keep it forever and would set it on the coffee table while he watched sesame street. he sobbed when they had to throw it away!